In the recent era, cities have been marked by the search for distinctive differentiation in the increasingly international competition for investment, spectacle events, jobs, skilled labour, students, residents and visitors. It has been a struggle for many places to find, articulate and project what’s different and attractive about their city. What’s authentic? What’s interesting and even unique? Many places have succumbed to what urban commentator Bruce Katz in the American context calls “Starbucks, stadia and stealing businesses” – adopting the same approaches and focus to their economic development. Ivan Turok bemoans this situation where cities trying to find distinctive differentiation end up pursuing the same types of strategies. Sharon Zukin too wonders how unique cities can be when they are following similar approaches of “programmed authenticity” across the world. Anna Klingman calls the results “brandscapes” to capture the ways in which apparently ubiquitous brands have been let loose by city authorities to dominate the cities in which we live, work and learn. Our colleague, Alastair Bonnett, goes further and calls them “blandscapes”: generic zones where the particularity of place is lost, places start to appear more like each other and – as Sophie will discuss shortly in relation to attachment and belonging – people find it hard to develop relationships with them. Celebrated as part of this important and timely exhibition, Newcastle Upon Tyne has many rich historical assets that configure its distinctiveness. One such was – and remains – Newcastle Brown Ale and the Tyne Brewery: a successful export enjoying double-digit sales growth over the last 15 years, now sold in over 40 countries around the world and entwined with its historic home in the city. Newcastle Brown Ale and the Tyne Brewery provide powerful and resonant images that have long constituted part of the distinctive DNA of the city and served as envoys of its unique reputation and culture. But a substantive opportunity has been squandered following Scottish and Newcastle’s decision to close the Tyne Brewery in the western city centre in 2004, relocating Newcastle Brown Ale production first to Dunston, Gateshead, and eventually to Tadcaster, Yorkshire, prompting dismay at its shifting origination. Reflecting the deeper currents of modernisation shaping the city and echoing some of its 1960s antecedents, the approach to redeveloping the Tyne Brewery site can be characterised as ‘fast development’. Newcastle City Council, the then Regional Development Agency ONE North East and Newcastle University were quick to acquire the site with the aspiration of deploying the land as part of their ‘Science City’ regeneration vision of urbanising the knowledge economy. The disappearance of 180 manufacturing jobs from a sizeable 6 hectare city centre site was even welcomed by some as a once in a generation chance for renewal and reconnection of the city’s disadvantaged West End with the city centre. Estimates of between £33m and £50m have been made of how much public money was paid for the site by the three local actors. S&N benefitted by repeating the trick first undertaken with the Fountainbridge Brewery in central Edinburgh of closing a city centre production site and liquidating a valuable fixed land holding into cash at a substantial profit. As the Brewery Manager at Dunston remarked at the time: “that is a lot of profit in beer…it would take us a lot of years to make that kind of profit” (Author’s Interview, 2007). 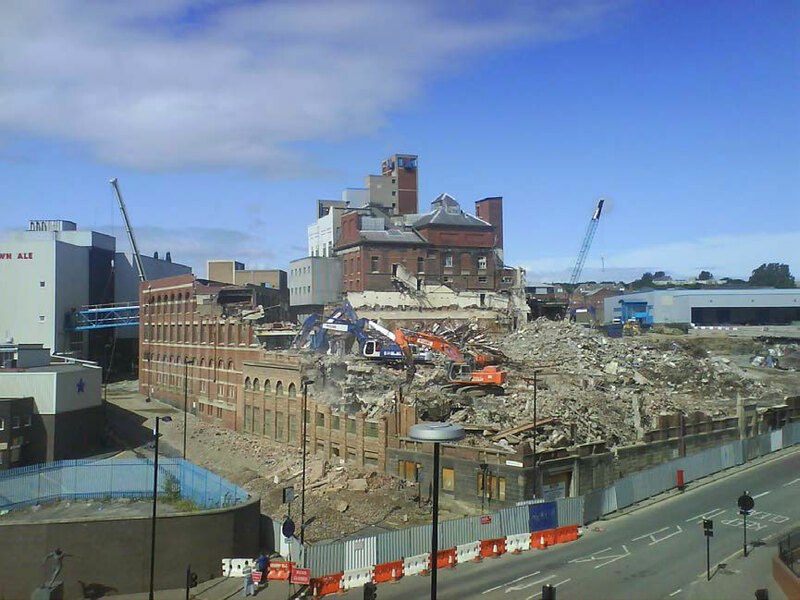 The pursuit of ‘fast development’ meant local actors rushed to clear the site and demolish the brewery buildings to create a clean slate for the new vision of science and technology-led urban renewal. But, in their haste, they erased what was internationally resonant and put Newcastle on the map as the ‘Home of Newcastle Brown Ale’ – irrespective of where the beer is actually brewed since the geographical associations to the city still provide the originated meaning and value of the Newcastle Brown Ale brand on its international travels. Lost too were facets that were architecturally interesting and significant about the historic site where beer had been brewed since 1868. Such elements of authenticity and uniqueness could have made valuable and meaningful contributions to the broader differentiation and regeneration of the city. The Campaign for Real Ale agrees, recognising how breweries are important cultural heritage in cities including buildings of historical significance and calling for their protection when being converted to uses which don’t celebrate the building’s past. This is not an argument for indiscriminately preserving everything but taking the time properly to assess what could be salvaged of distinctive meaning and value. Instead, noteworthy and unique things were lost. Artefacts of industrial archaeology were destroyed. Forever. Interesting buildings were demolished that could have been refurbished and revalorised as new uses for the wider community or even to house the coffee shops and eateries to service the consumption practices of the new knowledge workers envisaged to occupy the site. Historical markers of people and events were abandoned. With a historic wall plaque containing the Blue Star logo commemorating the lives of 36 brewers who lost their lives in World Wars I and II rescued by St. Andrew’s Church, Newcastle. Given its rapid rhythm and desire to quicken the circulation of capital, ‘fast development’ brooks little dissent and encourages no reflection. A rearguard ‘Save the Blue Star’ campaign was led by Northumbria University architecture student Lee Boxall. He argued that “Re-using industrial buildings, even just retaining key facades would not scupper the redevelopment, but would enhance it” and sought to retain and redevelop at least some of the Tyne Brewery as an internationally visible attraction along the lines of the Guinness Storehouse visitor centre in Dublin. But this protest made no dent in the rush for the glass and steel ‘blandscape’ of Science City and the imperative of commercial property development in competition with cities elsewhere in the UK and Europe. Under a different owner, only the old S&N office block was saved and converted into a hotel, where the Blue Star logo remains as the only marker of its former use. Little if any thought was given to more considered approaches – what we might contrast as ‘slow development’ – that are evident elsewhere in the UK and internationally. Where time has been taken properly to consider what can be salvaged that is of distinctive and wider value and meaning. Rustbelts elsewhere in the world have managed and with far more problematic sites than that occupied by a city centre brewery. The re-use of the old Zeche Zollverien coal mine buildings in Essen in the Ruhr in Germany is but one example. And, closer to home, the re-use of the headquarters of the former Tetley Brewery in Leeds as a new art gallery following its closure in 2011 after 189 years has proven successful. As well as being a distinctive feature and attraction for the city, it has been delivered for £1.5m – a fraction of the public money being invested in Science City and a presumably cost effective solution appealing for our austere times. So a historic and one-off opportunity was missed. No proper scrutiny and reflection on distinctive assets was considered in this fast development project. The question is, then, when there was an alternative route and much to recover, why did we go from Brown Ale to a ‘blandscape’? And are we perhaps heading for something even worse…?